My exploration of learning theories during this program has deepened my understanding of how learners at various life stages make meaning of the world around them. Piaget’s constructivism and cognitive development theories laid an important foundation in helping us understand not just sense-making, thinking, and learning in children, but really how they differed from adults. While as adults, we are not always consciously thinking about how we know or learn, we often see children through our own perspective of knowledge creation rather than seeing through their lens. Piaget’s work give us a breakdown of developmental stages of learning in children and his theory of constructivism can guide our understanding of how children make meaning by doing. 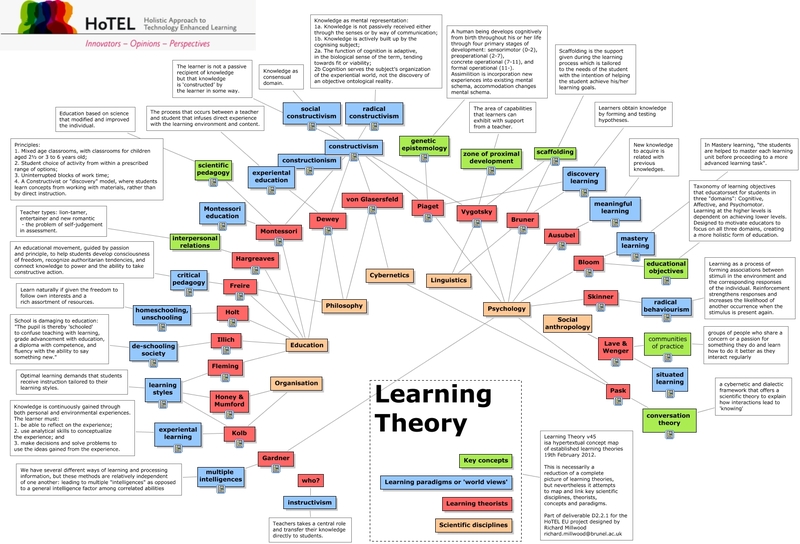 As learning theories (Montessori, Dewey, Papert, Vygotsky, Bloom, Skinner, Gardner, etc.) have been developed and adapted over the years, educators must synthesize and apply the research-based understandings we have gained (pedagogy), into a direct correlation with our practice. In my weblog post, “Connecting Brain-Based Teaching & Learning to Differentiated Instruction and Problem-Based Learning“, I examine brain-based teaching and how we can utilize this understanding of cognitive development to inform our practice. I recognized that while understanding developmental stages is important, we must understand our impact on those stages by how we facilitate learning and its environments. By highlighting the Brain/Mind Learning principles in my post, I presented a practical framework that can be used to facilitate learning appropriately in the classroom. I place value and emphasis on supporting learners emotionally and socially within the physical and pedagogical structure of the learning experiences, and always providing opportunities, choices, and tools for learners to make their own meaning. Another artifact, is my weblog post, “Rethinking how I balance struggle and flow in teaching and learning“, in which I consider the process by which each student undertakes when tackling a topic or task. I recognize that the experiences in the classroom are a specific slice of time in the broader life learning experience of each learner. When I can recognize and support each learner’s own unique process of sense-making, I know that their classroom learning experience becomes richer, more meaningful, and more contextualized. Struggling to make meaning and being empowered to discover your own answers are significant learning experiences that require a teacher to walk with students in their learning rather than leading them through it. By challenging how we as educators design the structure of learning within a classroom, I highlight the importance of reflecting what learners need at their various stages of cognitive development. An artifact that applies my understanding of human development, is the differentiated unit plan that I wrote for a 6th grade class in Anchorage, Alaska. The teacher had several classes of 6th grade students, developmentally transitioning between childhood and adolescence and with a wide range of learning abilities, interests, and needs. However, the teacher had identified several key and common issues that his students shared across the classes: students had difficulty demonstrating reading comprehension, identifying and articulating specific causes and effects, and relating and explaining new concepts. During the Spring 2015 iteration of Survivalcraft, three (3) of the teacher’s 6th grade classes participated in a MinecraftEdu experience, focusing on the book, “The Giver”, by Lois Lowry. During their experience, he noted that the unique and dynamic MinecraftEdu gameworld created new and exciting opportunities for his students to address the previously mentioned issues. After their experience, we discussed how to apply the MinecraftEdu experience through other content, and the teacher requested additional tools to practice and guide him in using MinecraftEdu with his students. We discussed how he typically taught his unit plan on the explorers Matthew Hensen and Robert Peary and I revised his unit plan to demonstrate how use of the MinecraftEdu gameworld was developmentally appropriate for his class, focusing on content that he provided. The unit plan effectively addresses the developmental needs of his students; students were asked to create a visual interpretation of the reading within the gameworld and to build objects and settings that portrayed concepts as they understood them in the reading. By literally building a timeline of events and taking viewers on a journey through each event, students would be able to connect specific actions, events, and ideas that led to each significant stage along the timeline, thus giving them a tangible tool to illustrate cause and effect. This differentiated unit plan also demonstrated that I met the ISTE Standards (NETS-C) 2a and 2b; by modeling then designing a MinecraftEdu learning experience, I was able to support the teacher to practice and learn how to plan and facilitate his own gameworld experience with his students. I based the unit plan on his students’ needs, interests, and abilities and created assessment tools within the lessons for both students and the teacher to evaluate progress. By incorporating choices for students within the technology-infused learning experience, I was able to demonstrate how to differentiate and support the diversity within the class. The unit plan covered all of the content provided by the teacher and more, exceeding the content and technology standards that were typically incorporated with this particular topic.